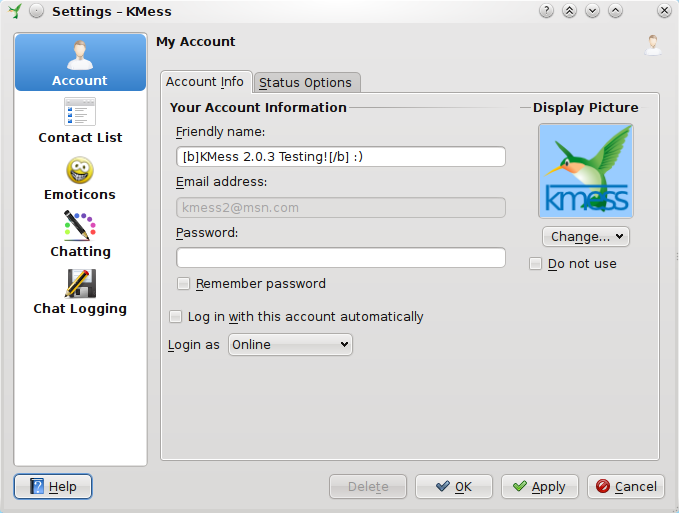 In the following visual guide we'd like to show you some of the features you will find in KMess 2.0. The main dialog received a nice redesign, as you can see in the screenshot. While redesiging the dialog, we found out the dialog already looks really nice with the standard Oxygen widget style. It still has the same login controls, of course, that allow you (or a visiting friend) to login quickly. The links at the bottom of the dialog provide direct access to the Live website, where you can create a new account, or have a new password sent to you. 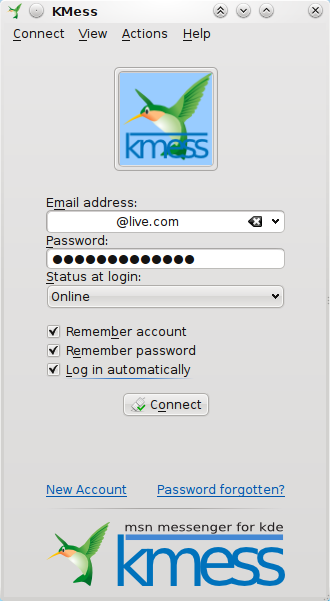 If you're behind a corporate firewall which blocks MSN connections, it's now still possible to connect to MSN using KMess. This is possible thanks to the added support for the "msn-http" fallback protocol. It makes the MSN connection to look like normal web traffic, which usually passes free through the firewall. The contact list dialog received a cleanup too. The toolbar is gone, together with the big shutdown button. You can still bring it back, and also fully customize it with any of the actions you can see in the menus. New cool features were added too. There is an instant search field, to quickly find the contact you're looking for. Offline contacts can be grouped in one group (so called "mixed" grouping). Pictures of other contacts can be displayed too, in various sizes. For a very minimalist look, you can also disable the menu, background picture, the new email link, activity drop down box and the 'now listening to..' text. Shortcuts can be configured for common actions. Contacts information can be exported to XML or CSV files. 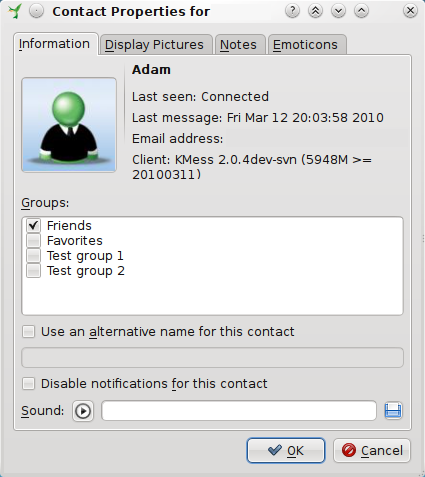 The tooltip displays the MSN client which a contact uses. Name, email, personal message and links can be copied directly from the context menu of a contact. A drop down list can be added at the bottom to track recent activity of contacts. 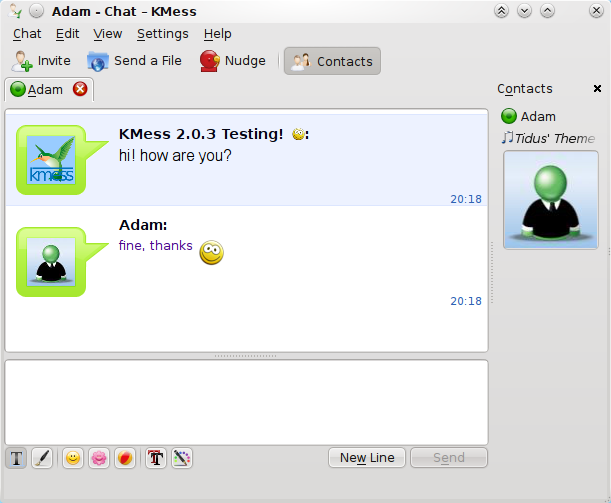 Being the central window for an instant messaging client, the chat window really needed a lot of improvements. So we made them! First of all, there is now support for tabbed chats, so you can have all your conversations in one single window. It works really sweetly, so it has even been enabled by default. It's also possible to use tabs for contacts in the same group, so you can have a window with tabs for "friends" and one for "coworkers" for example. The toolbars have a much better and fresh appearance, many rarely used butons have been removed. It's possible to configure the toolbars, so if you really liked those buttons you can bring them back. When a pictures says more then words... you can use Ink messaging! There are little mode switching buttons right below the message typing area to switch to ink drawing, or select emoticons/winks to send. The emoticon selector as docked panel. Continue chatting while you're invisible. Leaving messages to offline contacts. Text formatting of Messenger Plus Live is supported. Chat logging was improved, and a chat log browser was added. Automatic reconnection after restoring the Internet connection. Emoticon panels can also be displayed as dockable sidebar panels, and moved around. IRC-like commands support, like /away and /me. Fast retype of the previous messages using Ctrl+Up/Ctrl+Down. Showing status changes of contacts in the chat. Showing your own display picture in the sidebar. Larger text messages can be sent. The 'Account' tab of the settings dialog. Using again old display pictures. Block notifications when the status is set to Busy. A new chat style was added for dark color schemes. The browser selection on the global settings dialog. We've also added a new configuration dialog, to allow setting once for all accounts: for example the notifications options, which have now been unified. Some of the available settings comprehend: network connectivity, customized web browser and email client choosing, file transfer ports, and auto saving received files in a chosen folder. Moving and copying the contact between groups. Setting a custom name (an "alias") for the contact. Set a sound to be played when the person logs in and out. A list of past display pictures, also allowing you to set one as your own picture. Notes about each contact can be easily kept. Blacklisting annoying custom emoticons from a contact. 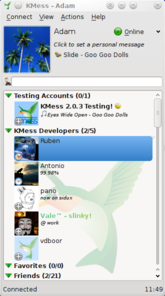 Attention has been given to KDE integration too! Upon a reboot, KMess is now able to return to the state it was in before. All error and warning messages are now visible as passive KDE notifications which blend beautifully with your Plasma desktop - and avoid interference with your other activities. 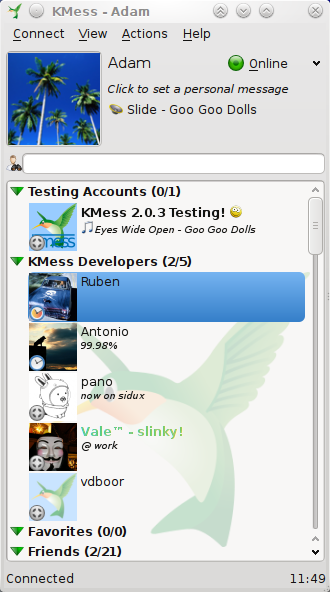 If you like to look for new stuff, KMess supports KDE's Get Hot New Stuff to download new chat styles. KWallet is now the preferred place to store the passwords of your accounts, for a safe and easy to use experience. Finally, Solid is used to add network awareness to KMess, it detects if a network connection is available. As always, we love to hear from you about things you liked and disliked. 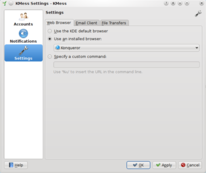 For this version, LikeBack from Basket was ported to KDE 4, heavily improved, and added so you can give us your feedback easily. You can find in the Help menu a "Send comment to developers" entry, with which you can quickly tell us developers about anything about KMess which comes to your mind! If you want to make a wish, have a suggestion, don't like a certain dialog window, it'll be very easy to tell us, thanks to Help menu's "Send comment to developers" entry and the optional toolbar buttons. We hope you'll have as much fun with KMess as we had creating it... Enjoy! Leave us a message at the KMess help forum !